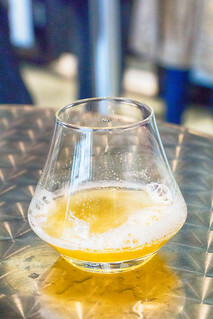 In my local beer community, there are quite a few aficionados who make pilgrimages to some of the more sought after breweries in order to bring home beers with limited distribution areas. 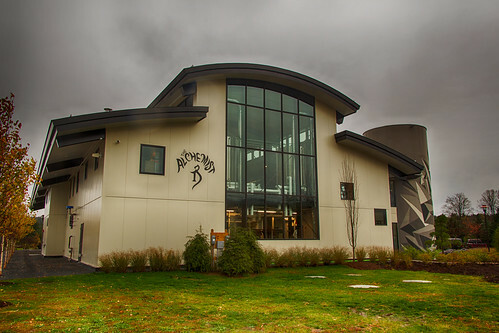 The Alchemist, in Stowe, Vermont is one such special brewery. While vacationing in nearby Montpelier, we definitely had to stop in to see what kind of brewery they were running, as well as bring home some of their famous beverages. Before going to The Alchemist, we heard rumors of exceptionally long lines just to get into the building. We were pleasantly surprised that at the time of our visit we were able to walk right in. 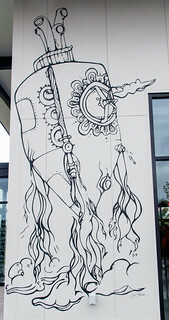 The outside of the building is gorgeous, with interesting artwork on the exterior, as well as some cool sculptures. This new visitor center opened in the summer of 2016 and is one of two facilities that they brew out of. Upon entering the building, two choices await you. One line leads to samples, the other line goes to registers where you can purchase your beer and other brewery paraphernalia. Between these two halves of the building, there are a few tall tables with no chairs, giving you a place to hang out while trying the beer. This area faces the main operating floor of their 30-barrel production facility. Full pints and food are not served here, however samples are free and are served in unique tasting glasses. You are allowed one sample at a time but this isn’t a problem as the line to try beer moved very quickly. When we visited, three beers were available to taste and purchase. Their lightest IPA, fresh and well balanced. This really does taste better the fresher you drink it. Big, juicy aroma. Dank and citrusy. Super big, lots of juicy grapefruit with wonderful dankness. What can I say about The Alchemist’s beer that others have not said before me? They certainly have a signature flavor, and while the brewers experiment with other styles, they really nail it with the IPAs. I was quite impressed with Focal Banger as I appreciated seeing them taking the time to make a slightly more light-bodied, approachable IPA. If you end up buying a few cans of Alchemist beer, take note of how much the beer changes and evolves. It is true what they say about drinking Heady Topper fresh, though I discovered that The Crusher was just as good with a bit of age on it. 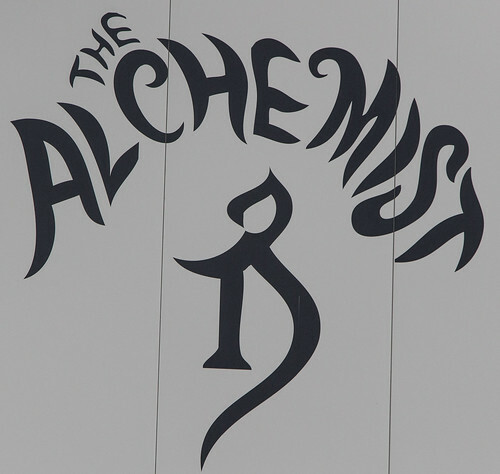 It’s worth mentioning that when visiting The Alchemist, the building is most often referred to as their Welcome Center. 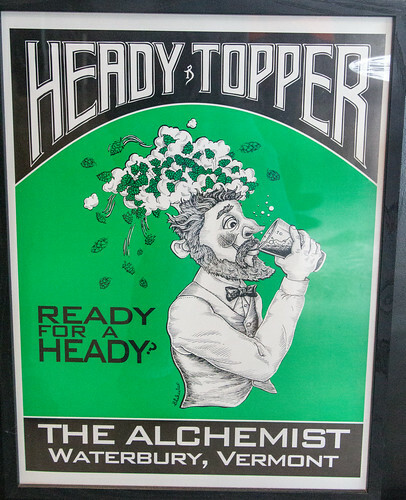 They have another brewing facility in Waterbury, Vermont that exclusively produces Heady Topper. The Stowe brewery / welcome center makes all the other beers. 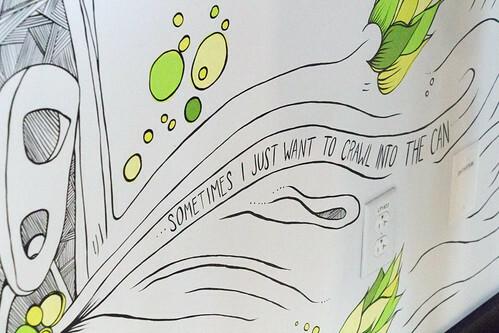 It is not designed as a place to hang out, but rather more of a storefront to buy their beer. I appreciated the large amount of informational displays that explained their processes and gave a brief history of the brewery. Photos of these signs are available in my Flickr gallery, but what follows is a quick summary of the highlights. The Alchemist got its start in 2003, when Jen and John Kimmich opened a brewpub in Waterbury. In 2011, this pub was completely flooded out due to Tropical Storm Irene, but all was not lost. This devastation coincided with the build-out of their new production brewery, known as the Cannery. As previously mentioned, all Heady Topper cans are produced there. Because of traffic concerns, they closed the Waterbury tasting room and retail shop in 2013. The recently opened new visitor center easily accommodates the throngs of passionate beer drinkers who want to purchase their beer. 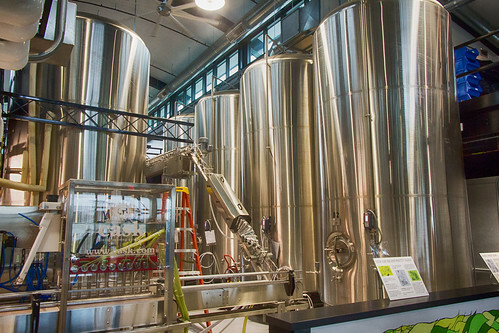 Here they are able to produce many of the specialty beers that were previously only available at the Waterbury brewpub. I was intrigued to learn that The Alchemist uses a proprietary yeast strain called VPB1188. It was brought to Vermont by Greg Noonan, a brewing pioneer, who later gave John Kimmich permission to use it in all his beers. The yeast is known for its strong attenuation properties and complex tropical fruit flavors that it often contributes to the beer. I appreciated the fact that other signs also gave extensive information about their suppliers of malts and hops. 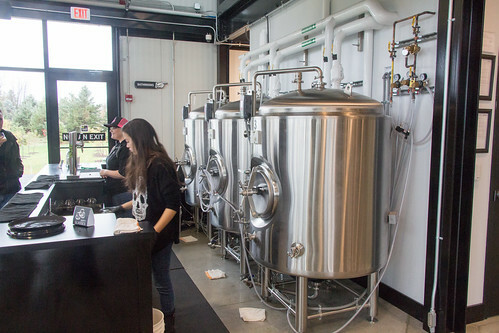 While there isn’t a lot to do while visiting The Alchemist, the ability to purchase their beer fresh from the source should be reason enough to go. 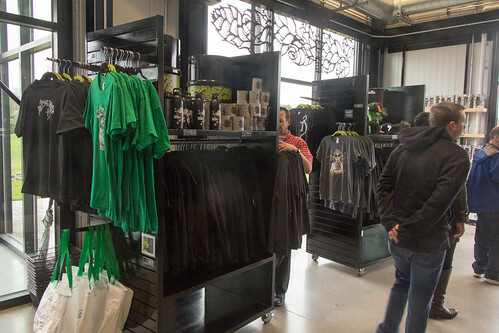 Various hats, shirts, hoodies, hot sauces, and soaps are also available to help commemorate your visit. Traveling with a dog? No problem! It seemed like half the people buying beer at the welcome center had brought their dogs with them. I can see why people make special trips to this brewery from out of state. Their unique flavor profiles are distinct and highly regarded. Just be sure to drink your Heady Topper as fresh as possible! Stowe, Vermont is situated in a fertile valley surrounded by gorgeous mountain ranges. It has become quite the tourist destination with recreational activities available year-round. Visitors can check out the Vermont Ski and Snowboard Museum or even the Trapp Family Lodge, the family depicted in The Sound of Music. In fact, there is a brewery at the Trapp Family Lodge, which will be the topic of my next article! 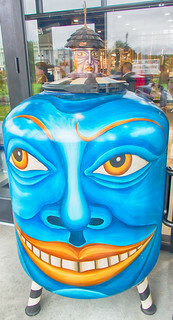 This entry was posted in Breweries and tagged Brewery, Vermont by tanders1. Bookmark the permalink. Quick question Tom you mentioned the VPB1188 yeast strain has strong attenuation properties. What does that mean exactly? Another great article, hope you had a good time on your birthday. We hope to see you again soon. Attenuation deals with what percentage of sugar yeast was able to eat and convert to alcohol. So, a strongly attenuating yeast is one that is very good at quickly eating up all the sugars and making alcohol. A byproduct of this process is many of the aromas and flavors that you taste within the final beer. Toasted this with Focal Banger.